John Peck (left) and Dr. Simon Talbot listened during the press event at Brigham and Womens Hospital. After his first serious injury in Iraq, Marine Sergeant John Peck begged doctors to let him return to the front lines. Unfortunately, it wasn’t for long. Peck stepped on an explosive device in Afghanistan in 2010, triggering a blast that led to the loss of his arms and legs. Six years later, Peck is drawing on that determination again. 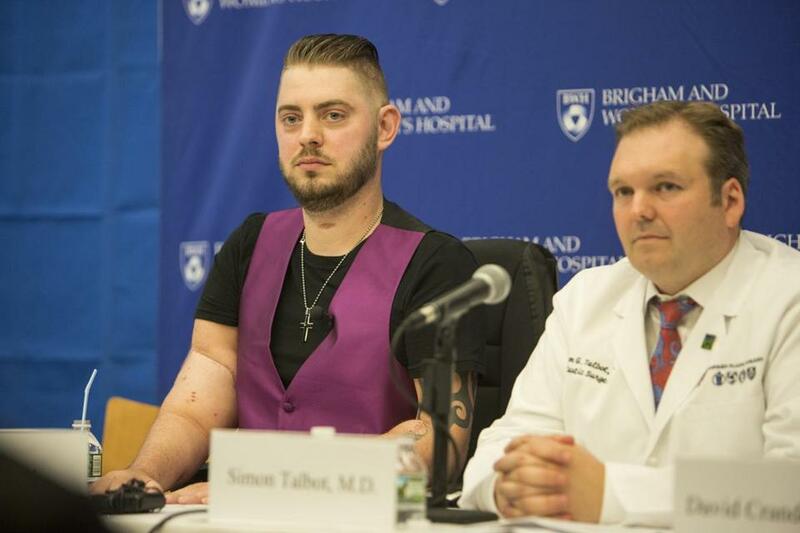 Brigham and Women’s Hospital said Wednesday that Peck, 31, underwent a double arm transplant in August and is now undergoing rehabilitation to learn to use his donated limbs. The 14-hour operation was the fourth double arm transplant performed at the Boston hospital, but the first such surgery for a patient injured during military service. Peck said during a press conference at the hospital that he wanted to do right by his donor, whose family has requested anonymity, by working hard to gain sensation and function in his arms over the coming months. His long-term goal is to attend culinary school, study cooking in Paris and Italy, and become a professional chef and Food Network star, he said. As he spoke, Peck moved his hands across a white tablecloth where he sat. His left arm was transplanted at the forearm, while his new right arm was attached above the elbow. Dr. Simon Talbot, one of Peck’s surgeons, said the operation was “seamless.’’ His patient’s immune system briefly rejected the new tissue, Talbot said, but that was averted through the use of anti-rejection medication. Talbot, director of upper extremity transplantation at the hospital, said it probably will take months of exercises, physical therapy, and nerve growth before Peck has full use of and feeling in his hands. He has been able to brush his teeth and feed himself with help from a special cuff with an attachment that grips objects. Dr. David Crandell, medical director of the amputee program at Spaulding Rehabilitation Network, said Peck is bringing a marine’s intensity to his recovery. Peck said he is very much looking forward to holding the hand of his fiancee, Jessica Paker, and being able to feel the sensation. The couple met online in February and got engaged last month on his birthday. Peck, who is originally from Illinois, was on patrol searching for Al Qaeda in Iraq in 2007 when his vehicle was hit by a roadside explosive. He was thrown from his seat and suffered a serious brain injury, which left him with memory loss and difficulty finding words. The bomb in Afghanistan blew off his legs and part of his right arm. Doctors eventually had to amputate his left arm because of a life-threatening infection. Peck said he discovered the Brigham transplant program when researching leg transplants online. The Brigham has such a program, and has evaluated potential candidates, but has not performed the procedure on a patient yet. Talbot said Peck may consider this in the future, but the procedure could be difficult because so much of his left leg is gone. After the arm transplant surgery, Peck said he awoke in the intensive care unit in such pain that he considered calling Talbot to ask him to remove the new arms. But since then, he has felt gradually better. He said he has to be careful not to injure his new arms, though, since he can’t feel much. He and Paker were cooking a shrimp and sausage dish recently, and as he stood by the stove, he had to remind himself not to get too close to the hot burner. Once he completes his initial rehabilitation at Spaulding, Peck and Paker will move to Walter Reed National Military Medical Center near Washington, D.C., to complete his recovery. The number of double arm transplants has been growing and now stands at 28 worldwide, Talbot said. The first double arm transplant at the Brigham was performed in 2011, on Richard Mangino of Revere. In 2012, Brigham surgeons transplanted a face on Charla Nash of Connecticut, but a double arm transplant done at the same time later failed because of infection. Also in 2012, doctors at Johns Hopkins Hospital transplanted arms onto Brendan M. Marrocco, an infantryman who lost all four limbs in a 2009 roadside bomb attack. In 2014, surgeons sewed new arms onto Will Lautzenheiser, a filmmaker and comedian who had his arms and legs amputated because of a life-threatening infection. Talbot said the surgeries have gotten smoother each time. He said one challenge with Peck’s surgery is that he had lost extensive muscle in his infected left arm that needed to be replaced. Doctors believe two leg transplants have been done, in Spain and Canada, but never in the United States.